It really happened. A 19-year-old German conscript right at the end of the war who deserted - as many were doing then - and after being chased all muddy by a patrol, found a big military vehicle and a complete captain's uniform (it comes with a monocle) and made good use of them, impersonating an officer, raising the stakes each time he's challenged to become, before very long, in the desperate chaos of a defeated Germany, the perpetrator of atrocities. At once after he's donned the uniform, another deserter appears, claiming to have been "separated from my unit" (that's what they all say), and asks to be attached to the "Hauptmann." He becomes the "Hauptmann's" driver. He knows how. The vehicle goes. And now, "Der Hauptmann" just has to invent a mission. A wild ride of improvisation and bluff begins, which the kid in the uniform somehow survives and triumphs in. 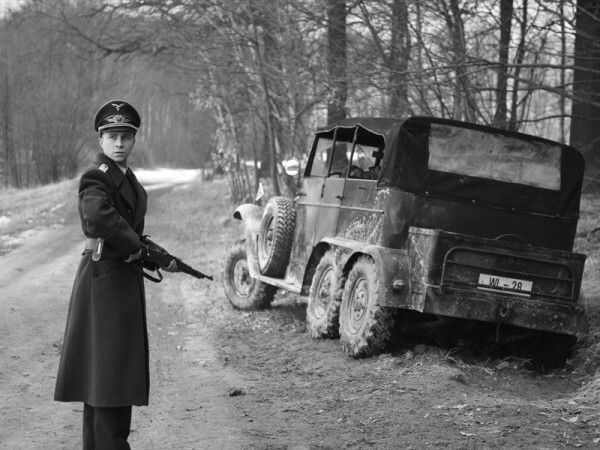 This situation is electric, terrifying, exhilarating and, when "Der Hauptmann" has a whole unit of deserters attached to him and comes to a prison camp full of German deserters and criminals he decides to massacre, increasingly nauseating. But while the movie is powerful, it's never close to being a great one. "It starts out with a bang but swiftly falls into a kind of prolonged and distressingly outlandish tedium, and lodges there for the better part of its rather taxing running time" (Peter Debruge, Variety). And yet, you watch it, and its message and its content are powerful even if its artistry is weak around the edges. Lead actor Max Hubacher, who plays the imposter, Willi Herold, has a bold, bald, very Aryan face, like a junior, sweatier version of Max Riemelt of "Sense8," white and chiseled, that goes from lank and terrified to emboldened, then maddened with power. Willi doesn't just ride with his new identity but fly and rage with it. He goes mad. He looks so small in his uniform - till he swells to fit it. Boldly, under the circumstances, Schwentke makes Herold sympathetic, an everyman underdog tossed about by the tides of fortune. But indeed the director himself is an underdog trying to raise his own rank, against logic. Ever since 2003, Schwentke was making bad Hollywood movies, the two latest of which took down the not very great "Divergent" series into total flops. And as David Edelstein comments in his review of The Captain, "Hollywood looks more fondly on serial killers than franchise killers." So Schwentke goes back to his native Germany and makes this bold film in stunning black and white, a film with all kinds of period flavor that yet takes its theme right into the present with a queasy reality-show end-credit sequence where the costumed cast members are seen making contemporary urban Germans cower and kowtow over and over, working with just a shtick and a uniform. Instinctively we don't want Herold to get caught, which makes The Captain participatory. Watching it is like being at a school play, where we pray for our friends or our kids not to humiliate themselves. And this is also a humble working man, showing up the pompous braggadocio of Nazis. Nonetheless we soon realize Herold is into Hitler, into being a Nazi. He may have deserted out of self-preservation, to escape a desperate situation. But once his charade puts him in an equally dangerous situation that he seeks to survive by dominating it, his "Heil Hitlers" are passionate. He starts claiming he's been officially informed that some very fishy stuff is going on here behind the lines and that he has been commissioned by der Führer himself to investigate and make things right. This claim succeeds - mostly - by virtue of its absurd boldness, being a bluff lesser, more sensible men are incapable of. Each situation Herald enters - and creates - is a yet more desperate and dangerous one, which he survives by bolder and bolder bluffs. Violence is the most powerful language. Herald loses his cherry when he takes out his pistol and executes a deserter on the spot. It's not very far from that to have his ragged crew push with their Captain for mass executions. There is a sensible officer at the prison camp who fights this. But the film quickly dodges this issue: another man calls the same command and puts forth an argument. Again Herald escapes having to present his papers. And a gruesome series of executions gets under way. From here the film enters mad decadent mode, and some scenes are familiar, the drunken brawls, the half naked women, the drunken men in shiny jack boots. A memorable tableau nonetheless: Herald's men enter a bedroom and rip out a man in bed with a woman. Herald walks in, and the woman bares her breasts for him - not for him, for the uniform. Despite its sequences of pungent nightmare, the film's action, as De Bruge commented, becomes absurdly tedious through a lack of coherent progression or sense of pace. Nonetheless it gains some resonance through being framed, for all its horrible violence, by tragicomedy and farce. It even has the stunning quality of a drawn-out lie, like Jerzy Kosiński's The Painted Bird, but with more longeurs. And as Jeannette Catsoulis says in her NY Times review, it depicts "Naziism as a communicable disease" whose power over morality and conscience is invincible. No one in America could have made this movie, and we're not going to see another like it for a while. The Captain/Der Hauptmann, 118 mins., debuted at Toronto Sept. 2017, other festivals, opening in the US 27 July 2018. Metascore 64%. Released in France 21 Mar. 2018 (AlloCiné press rating 2.9).